Carlos Carrasco struck out 14 batters over 7 1/3 innings leading Indians to a 4-1 win over the Jays. R.A Dickey got the loss. The game went 19 innings and decimated both teams bullpens. In the 19th inning, Toronto position player Darwin Barney was put in as a relief pitcher and gave up a home run to Carlos Santana for the game winner. 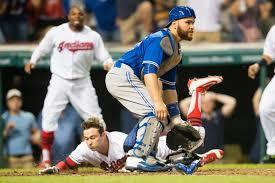 The Jays halted a 14 game Cleveland winning streak beating the Indians 9-6. A safe slide home by Ezequiel Carrera brake a 6-6 tie in the 8th. Former Blue Jay Rajai Davis hit for the cycle. The Jays won a lob-sided game 17-1 with home runs by Russell Martin, Troy Tulowitzki, and Justin Smoak. J.A. Happ held the tribe to one run over seven innings. With the game tied at 2 in the bottom of the ninth, Tyler Naquin walked off the Indians with a dramatic inside the park home run off Jays closer Roberto Osuna and secure a 3-2 win for the tribe. Indians starter Josh Tomlin surrendered 3 home runs including a go ahead shot by Edwin Encarnacion in the 5th to lead the Jays to 6-5 victory. In the final game of the regular season against each other, Cleveland won 3-2 even after a stellar performance by Jays starter Marcus Stroman.